Thanks to the recent subscribers! Not sure what launched the wave, but I’m so glad you found the site and took the time to subscribe. I’ve been waiting for some time to publish this post. Not because I didn’t want to, no, but because it contains SPOILERS. If you haven’t seen The Avengers: Infinity War by this point, you need prayer. Go see it and then read this post…unless superhero movies just aren’t your thing. Of course, if superhero movies aren’t your thing then you probably haven’t subscribed to this site because so far it’s mostly been about superheroes and therefore are in no danger of having Infinity War ruined for you. Sad News: We are living in a time where Christianity has never been made to look more pathetic. Take a look at this tweet that I ran across just yesterday. What? It looks like people of faith just don’t have our stuff together. We look like we aren’t on the same side. Some of us just do our thing while some other kind of crazy happens over there – which is a major theme that runs throughout the Avengers meta-story and really comes to a head in Infinity War. In our mythology, Christians are the good guys, the superheroes tasked with overcoming evil in all of its forms, but we know that’s not true. We know it because, well, look at the tweets above. We know it because we don’t fight evil in all of its forms. Not really. Some evil, we jump into bed with. Other evil we hide and lie about. We don’t rally around injustice equally. We tweet about it. Maybe, we instagram something. But we don’t commit ourselves to means of peace and civil well being. We don’t exhaust ourselves for the common good. We barely serve our neighbors. C’mon…if we are honest, we don’t even know our neighbors. My point is: Christians are a mess. So are The Avengers. Infinity War is a story about a group of men and women who have to work together to overcome evil. There are just two problems: The heroes don’t know how to work together and the villain has no clue that he’s evil. One thing I love about the Marvel franchises is the variety of powers and personalities that each series produces. I love the brash sarcasm of Iron Man (apostle), the vulnerable invincibility of Spider Man’s (shepherd) teenager-ness. I love the laughter in the face of certain destruction that we get from the Guardians of the Galaxy (family on mission) and the wry, British wit you excavate from Dr. Strange (teacher). Captain America (evangelist) is probably my favorite, but that’s just me…unless Thor (apostle) is. I love the way that those movies have progressed in quality. I could watch Thor: Ragnorok all day long. So good. My hat’s off to the writers of Infinity War! They did something that I’ve never experience in a film (or possibly anywhere) before: The bad guy, Thanos, is the protagonist of the film. There’s an awesome, salty languaged post about this you can read, but the gist of it is this: Thanos, the villain who has been lurking in the credits of most of the whole Marvel lifespan, steps into this film and embarks on the classic hero’s journey. As he pursues his quest, he has to overcome obstacles (in the form of The Avengers) that get in his way. Overcoming the obstacles, Thanos, finally realizes his quest and enjoys the peace of his happy ending. It’s bizarre. You don’t have to see it that way and you may not, but it’s there, I promise. The point is this: People see themselves, largely, as the protagonists of their story. Non-Christians do not see themselves as villains in God’s creation, they see themselves as a necessary part of it. What I’m not saying is that Non-Christians are Thanos, evil demigods bent on destroying all things holy and good, but I’ve experienced a Christian worldview that sees them, treats them and talks about them as though they were. I mean…White Evanglical Protestants view refugees that way, many of whom are actually Christians. This simply must change if the mission of the gospel is going to take root in the soil of our culture. Missionally, we need to write a better story, to stop seeing the world through the binary lens of Christian and non-Christian, good guys and villians. Of course, there are Christians and enemies of Christ (Jude), but by and large, most people aren’t flat out enemies of the Lord. They may just be enemies of White Evangelical Protestants. I can see that number growing, even among Christians. We need a new script, one that acknowledges that people are people; people that are the heroes of their own stories. They have goals that they are pursuing, a vision they are chasing, people they are loving, hearts that are breaking, joy that is growing, hope that is dogged, peace that is elusive – regardless of their religion status. They are worthy of your time. They are worth investing in. We need a script that acknowledges the humanity of one another; that we have dreams, some we’ve watched die, others we’ve given everything we have to fight for. We have been hurt deeply. We have experienced pain we have never been able to describe. We all long to belong, and honestly, Christianity doesn’t have the most welcoming PR right now. We all experience what it is to be human beings together on the planet. The Avengers: Infinity War ends in a sobering place. We are left with a future that we didn’t want because the “good guys” couldn’t pull it together and figure out a way to use their powers to stop Thanos. There is a non-Christian people who are reading the same headlines and discovering that we are not for them. It’s time to change the narrative, to work together, to harness love like we learned to harness fire. You know, like Jesus taught. 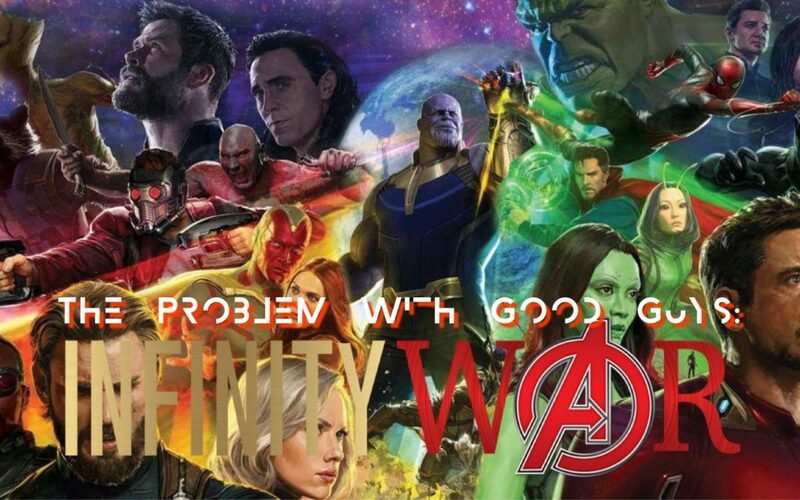 The Avengers: Infinity War is a great example of the confusion of our world. Who are the good guys? What do we do when the good guys don’t act like the good guys? What does it mean to be the good guys? The Gospels describe the good guys as people love who their neighbor with a love that benefits the other at great cost themselves (agape). The good guys lay down their lives for their friends. Who do you call ‘friends’?. The good guys humble themselves in the sight of the Lord. In essence, the good guys do what The Good Guy taught us to do: to see Thanos as the hero of his story and tell him about Hero of every story. Tell him with words. Tell him with a shared life. Tell him with love. And there, the script begins to change and we begin to see the Story as it was written to be told.